Master gamer AAA and his little sister Abigail are trapped inside the very games they love to play by an evil Blumaroo, Roothless! Work your way through five levels styled after classic Neopets games and help the young gamers to escape! The first choice you have in the game is which character you want to play as: AAA or Abigail. Each character has their own strengths and weaknesses, but generally Abigail is easier to play with and you earn more points from playing with AAA. Your character will automatically move forward, unless they encounter an obstacle that they can't walk over. 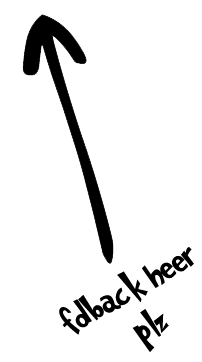 When they reach an obstacle they need to jump over, use the spacebar to jump. You advance to the next level each time you earn another 800 points (if you're playing as Abigail) or 1,000 points (if you're playing as AAA). 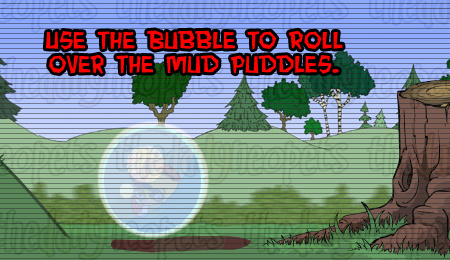 As you progress through the levels you will collect five items which help you as you continue on: a shovel, a bubble, a spring, a helmet and a shield. They appear in your item bar as you collect them. The final aspect of the game is Scram, Roothless' bumble-brained servant. Transported into the game with AAA and Abigail, he will try to catch up with you and stop you from reaching the end! He moves at a fairly steady pace, and when you're just running (i.e. 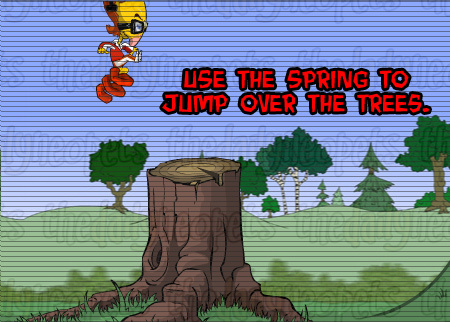 not using an item or jumping) you move faster than he does so you should be able to get a good head start on him in the first two levels. 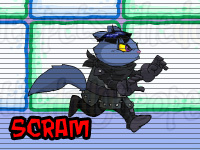 You can keep track of how far ahead you are on the map bar at the top of your game screen - you're the black character and Scram is the red one. Incidentally, you can also use the map bar to see how far you have to go in the game! 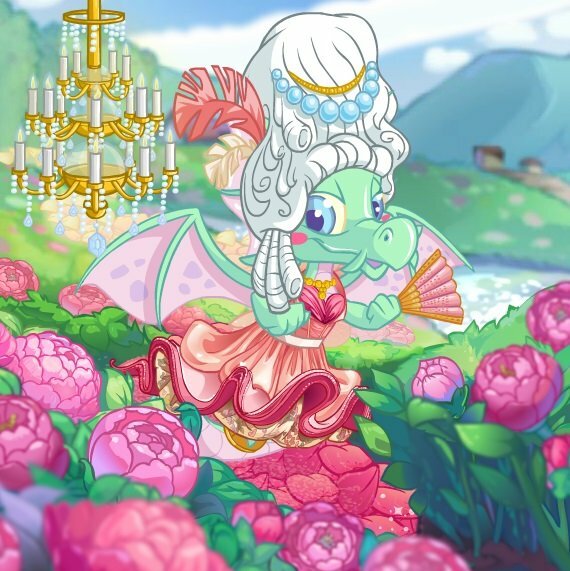 But what do you use each item for? Here's a quick run-through of which items you will need, and what they are used for, in each level. You may find that you can jump normally over the trees instead if you want to, but watch out - if you don't quite make it you will stall there and Scram might catch up with you! 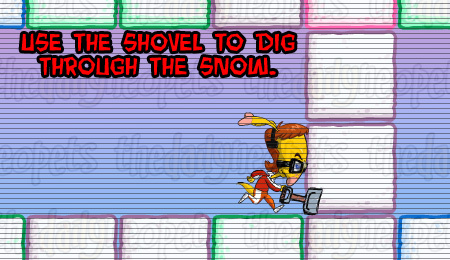 You can also use the shovel to dig through blocks. This is especially useful if you're playing and find the helmet appears immediately after a 3-block stack. If you spring jump over the stack, you will miss the helmet! 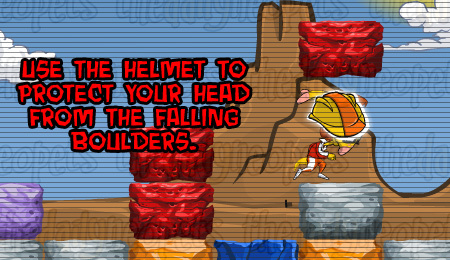 Digging through, however, will allow you to collect the helmet. This happens most commonly when you're playing as AAA, but has been known to happen with Abigail as well. 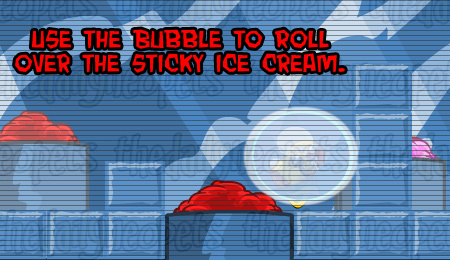 Avoid the flying ice cream by using the shield for cones that will hit below your character's neck, and the helmet for ones that will hit you in the head. 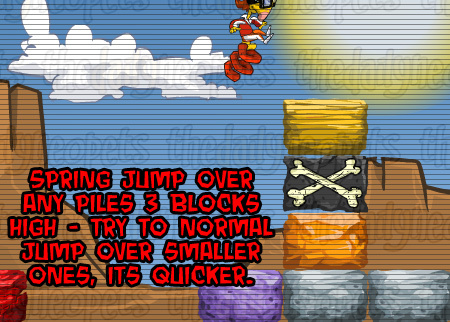 You will also need the spring for jumping over higher columns of blocks. Pass the skeith pirates using the shield, the kougra pirates with the helmet. Again, you'll need the spring for jumping over higher columns of crates. Dungeon Dash is a game with a maximum score. If you score the max of 5,000, you will earn the gold trophy, regardless of whether you are in the Top 17. If you play early in the month, you may have a chance to win the bronze or silver trophy, but later in the month the Top 17 fills up with max scores. Unlike other max score games such as Bruno's Backwoods Breakaway or Neopian Battlefield Legends, though, the high score tables for Dungeon Dash usually don't fill up. That means as long as you submit a score of 5,000, you are pretty much guaranteed to earn the gold trophy no matter what the time of the month. To score 5,000, you have to play with AAA. AAA can earn 1,000 points per level. On the other hand, Abigail advances levels every 800 points, so her max score is 4,000. Use the keyboard and memorize the keys for each item. Figure out a way to press all the keys that's comfortable for you. One popular way is to using your left hand for the keys. 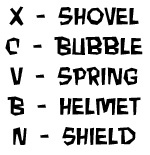 Put your little finger (pinky) on the X for the shovel, ring finger on the C for the bubble, middle finger on the V for the spring, and thumb on the spacebar to jump, and then use your index finger on both the B and the N for the helmet and shield. That way you don't have to remember which key to press, just which finger to use. Konata says, "Dungeon Dash is one of the hardest games to beat in Neopia. I have played it countless times and have some great tips. First of all, when playing, hold down the right key and your character should go slightly faster. Another tip is to use the bubble as much as you can especially when using the spring. 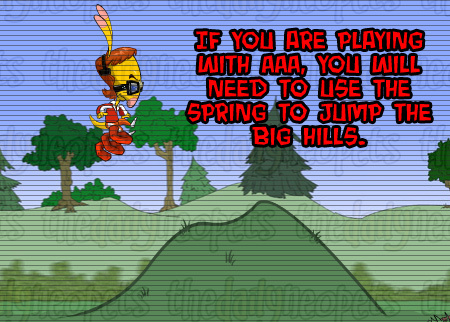 For example, when you use the spring to jump onto high areas like trees in the second stage or tall blocks or crates, immediately use the bubble to roll off that area to get a burst of speed because your character usually slows when they run up high. 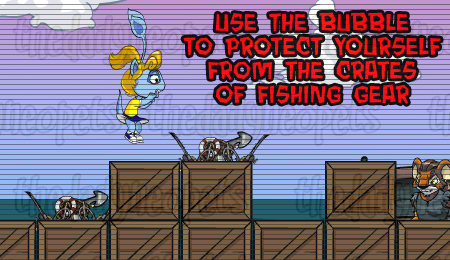 The game gets harder where you have to get past many enemies and hazards. A good strategy is to put up your helmet and shield over and over and only pause to use others. Plus, bubbles make you go even faster." This game is hard - there's no other way to put it. The best thing you can do is practice, practice, practice. Hopefully with practice and the tips outlined in the guide, you will be able to reach the end and set AAA and Abigail free! The Snowager is awake. He'll be sleeping in 3 hours, 57 minutes.